WildStar is one of those games that I’ve really wanted to play ever since I played it for a short time in beta, but I’ve been kept away by the subscription fee. I hate subscriptions because they make me feel guilty for playing free to play games when I feel like it. I’ve been dabbling in Marvel Heroes and Lord of the Rings Online lately, and I don’t feel bad for not playing Guild Wars 2 even though I would consider it my “main” game right now because it doesn’t have a subscription. The news that WildStar is finally going free to play has really got me excited. The features matrix looks pretty generous, especially for people who previously owned a copy of the game. Only time will show what hidden annoyances are in there to try to get you to shell out some cash, but from the looks of it I don’t think it’ll be game-breaking. So when the Humble Bundle included WildStar digital edition in the “pay what you want” tier of its E3 bundle, I was there in a heartbeat. One month subscription, plus a free account upgrade when it goes free to play? Absolutely worth a dollar. Plus it gives me a chance to get into the game before the madness of the inevitable rush of players trying out the game for the first time when it goes free to play. For reasons I haven’t been able to determine, the game still doesn’t like my dual graphics card CrossFireX setup (one card is maxed and the other sits at zero) so I have to turn the graphics pretty much all the way down and the frame rate is still painfully low (around 15 on a good day). It was excusable in beta, but come on, the game has been out for a year now. I guess this is the motivation I need to finally save for the single, high end card I’ve had my eye on (a GeForce this time, because Radeon drivers are really unstable half the time, though at least they’ve finally gotten to the point where they just freeze up for a while and recover and don’t just bluescreen like when I first built this computer). In a lot of games I go through a lot of characters at the beginning because it takes me a few tries to find one that clicks with me. In WildStar, I’ve had trouble picking a class because all of them are really fun to play. I’ve settled into the Warrior and the Esper, but Spellslinger and Stalker are appealing as well. Strangely, the Engineer still doesn’t interest me that much. I feel like it should; it’s a tank with pets that do extra DPS or pocket healing, which sounds really fun in theory, but in practice it just doesn’t do it for me. But hey, I said that about the Guild Wars 2 Engineer at first as well, and then it became my first 80. Anyway, I absolutely love the unique combat system they have in WildStar, with telegraph AoEs that combine the best of both tab-targeting of WoW-like MMOs and the FPS style aiming I normally associate with the term “action combat” in an MMO. Perhaps the most refreshing thing about the game is overall personality of the game. 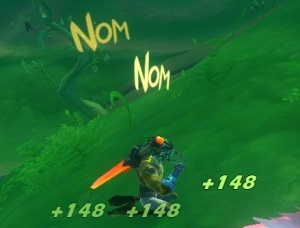 One of my favorite moments was the first time I used a food item and, as my character sat down and began to eat, “NOM NOM NOM” popped up over his head as he healed. Similarly, I love the fact that taunts elicit random grawlix over the target’s head. Carbine has also done a great job giving the NPCs a lot of personality. I love voiceover lines from Arwick mocking typical generic MMO fantasy voice toasts like “The queen would wish to convey her thanks. So… thanks!” and “You’ve much to do. So get going already!” The Lopp are basically Guild Wars 2’s Skritt with a less annoying accent. And the Chua’s sadistic mad scientist one liners are always entertaining. I know the announcer got a lot of hate, especially early on when there was no way to turn off the narration when you enter a new zone, but I think he really adds a lot to the over-the-top, goofy vibe of the game. Also, I think every game should make sarcastic remarks when you die. Coming Next Update: The Horde Invades Nexus! Even though I’m running it at minimum settings, Nexus still looks nice because it’s not even attempting to be realistic, opting for a comic book inspired feel. It’s funny, sometimes the style of WildStar seems really unique, but then other times it slaps you in the face that this game was made by ex WoW devs. Yes, a lot of games have much more shameless ripoffs of WoW’s visual style, but it seems more obvious when you’re riding around on your hoverboard and talking to robot trees and suddenly you see zeppelins floating around buildings made out of giant bones, garnished iron bands with bolts the size of your fist, and covered in rough-edged animal skins. Suddenly you feel like you should be killing Orcs and Trolls instead of Draken and Chua. It’s not terribly immersion breaking, just something that jumps out at me from time to time. I could go on, but the point is I’m really enjoying my time in WildStar. Sadly I haven’t gotten to dig into the housing system much yet, and that’s half of what my WildStar-playing friends get excited about. I’m toying with the idea of continuing my subscription after my 30 days is up, but I also feel like I should just wait till it goes free to play. I’ve never been the type who has to be ahead of everyone else, but with the amount of lag I’ve been getting in some zones at peak hours, I’m betting there will be a lot of downtime (or at least de facto downtime where the game is so laggy it’s no longer fun to play) as soon as there’s a large influx of players. Hopefully they have a plan for that, we’ll see. Either way, I’m glad to have the game back in my rotation.